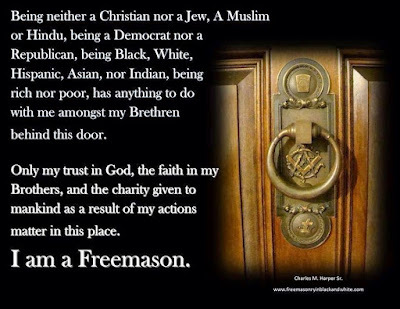 Freemasons For Dummies: "Freemasonry In Black and White"
The knowledge found within the walls of a lodge can make a man truly a better man within his faith, a better father, son, husband and ultimately a better man for the world. There are issues, academic and social, that are preventing this process from happening in Masonic lodges today. For centuries, a Masonic Lodge has been the place of higher learning. Kings, scholars, presidents, white collar and blue collar individuals, have all advanced the beauty that the Creator of humankind, God, has innately placed within each of us. Like the power of centripetal force, goodness revolving in the center attracts goodness to it. In America, this circular motion is stalling and causes a regression in positive men emanating the beauty of the craft into society. Quietly, the separation of men due to the darkness of America's past hampers the liberation of each heart. A lack of the ability to invest time in each Mason, as was available in the past during the golden age of the fraternity, to instill in him the beauty of truly being a point within a circle of ALL mankind, has created a domino effect of negative repercussions that is gaining traction with the ability of Masons to communicate and see Masonry practiced in all parts of the world like never before. Now is the time to halt the slide and get back to the foundation and intent of the craft. No longer can we quietly hide behind the long existing reverence and mystic [tie] of the craft and hope the social issues that led to a division of men, and the lack of holding each Brother accountable of the responsibility to Master the Craft and being truly declared a Master Builder, will quietly be held to a minimum until the Fraternity recovers by a hopeful influx of new inventive minds. These men are already here entering our lodges seeking light and finding the old ideas working against new ones. Traditions founded out of practice and not of ancient usage and logic guarding the door of true spiritual growth. In his book, Brother Harper tells his own personal story of initiation into what we regard as "clandestine" Freemasonry, something most of us have heard of in our ritual, but rarely, if ever, come into contact with. He discusses the proliferation of these types of lodges, particularly in the African-American community in the US, and he recounts his eventual path to joining a regular, recognized lodge. Harper also delves into the definitions of Masonic regularity and recognition. And he explores the uncomfortable but undeniable subject of racial segregation in historic and modern Masonry, from his own unique perspective as a mixed race American. It is a book all of us should read to have a better understanding of each other, and how and why we have faltered in the pursuit of the high ideals we purport to espouse. Typos be damned. Just this small sample is thoughtful and elegant and I look forward to reading it.